Whether you operate an auto dealership or an administrative office, you aim to keep your business operating costs low and stress-free. Dealing with printers, copiers, and fax machines can be frustrating, especially when they don’t work or are too costly to maintain. Here are some ways that printer services, like those offered by Protech Business Systems, can help protect your business and make the frustrations of dealing with toner and printers a thing of the past. Printers run out of ink, break down, or need maintenance when you absolutely need them to work. Unless your company is in the business of printer supplies, you won’t have the printer parts on hand. You may have to wait weeks to get a part in for a repair. When you have a printer services agreement with Protech, we take care of your printers for you. We have many of the most popular printer repair parts available, so you’ll save time and get to use your printer again sooner. 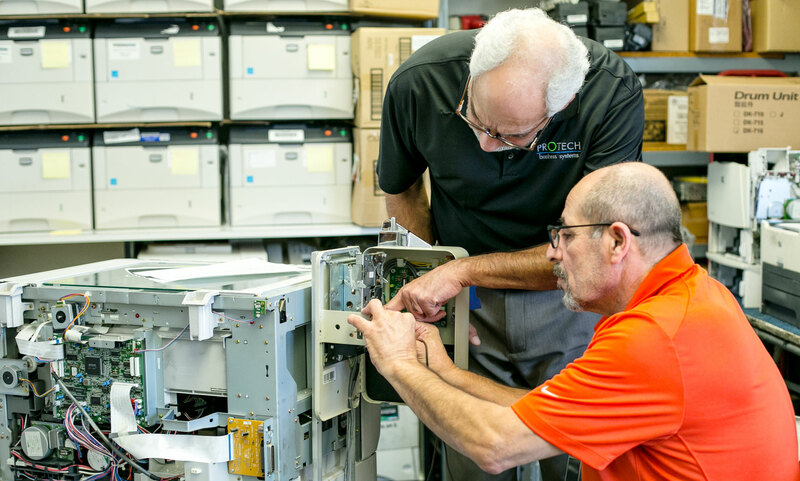 There’s no reason that one of your staff members should waste paid time trying to repair your printer when you can have an expert technician at Protech take care of it for you. Plus, if you have any questions, you can give us a call any time. When the time comes to replace an inkjet printer, we can work with you to buy a printer that meets your business’s needs. We will set you up with a device that works with high yield toner so you’ll save money without constantly replacing cartridges. Additionally, we can automate your toner replacement process based on what you actually use so you never have to worry about running out. It’s time to save money, time, and frustration with print services. If your business is in the Los Angeles area, contact Protech Biz Systems to learn more about how we can help.